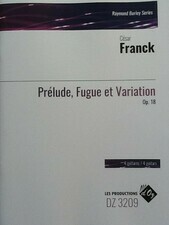 César Franck's beautiful op.18 'Prélude, Fugue and Variation' was initially written for organ. The composer then reworked it for harmonium and piano. It's a piece the arranger has enjoyed for many years and it was a pleasant surprise to discover that it worked so well for guitar quartet.